Despite stringent labor laws, there are still many professions that remain dangerous to heart and health and farming happens to be one of them. From the less visible impacts of living rurally and the impact of long commuter hours, to the more direct and adverse affects of working in fields that have chemicals, to having to work under extreme weather conditions, our nation's slaughterhouses, factories and fields present significant barriers to having an equitable food system that cares for the environment and its people. Take this summers latest report that another farmworker died from heat in California. How can such treatment be permissible in the United States? Since we're importing a large percentage of our food from overseas, how is that food produced where there are even less labor and environmental laws? These questions beg for a domestic food labeling program, but this will undoubtedly require that eaters pick up the extra costs of such a labeling program. Critics of the fair trade movement claim that little reciprocity is reported by many overseas that participate in fair trade campaigns. If this is true, what governing body should be accountable for monitoring and tracking? While the USDA seems a natural candidate, the administration hardly gets a chance to check imported food for pests, let alone track that imports come from fair wage sources. fair wages are assessed to farm workers and that eaters will have to pay the extra cost of such labeling. For Rodolfo Ceballos Carrillo (54) in Kern County, California last week Friday, the high temperatures led to a collapse in the field - something that happens repeatedly during hot summer months all over the country. My heart goes out to his family and loved ones. Did Industrial Food Really Liberate Women? I've been chewing over the whole gender, food, and industrialization business lately and have determined that while industrialized food, and convenience machines (dishwashers, vacuums, etc. ), helped liberate us women from kitchens and allowed us to enter the workforce (while raising families at the same time!) it has been to the misfortune to many. While having meaningful, engaging, and intellectually stimulating work beyond the realms of laundry and meal preparation is extremely important, we have been mislead into thinking that the home could remain place of respite without someone there keeping the fires burning. In fact, women today are finding alternative careers that allow them to do both. Or, men are even getting involved. 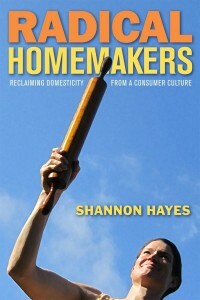 As Shannon Hayes in her recent book "Radical Homemakers," it's most often women that tend to set their careers aside for family, but not always. Today we are seeing men and women alike reclaiming their domesticity from a consumer culture. Because really, how are we supposed to eat seasonally without canning, freezing, and planning ahead? How are we to eat more healthfully without adding more time to our food budgets? Food for thought.